Dette er en veldig viktig artikkel for å forstå diafragmas rolle i både pust og bevegelse, og ifh smertetilstander i ryggraden. Nevner en lovende teknikk for å styrke diafragma og støttemuskulatur hvor man blåser opp en ballong og strammer kjernemuskulaturen. Nevner Zone of Apposition (ZOA) som beskriver diafragmas bevegelsesmuligheter. Ved lav ZOA har diafrgma lite bevegelse. Vi ønsker å øke ZOA. Denne øvelsen er konstruert basert på fysioterapeutisk prinsipper, men i Verkstedet Breathing System har vi øvelser som er gir samme resultater på diafragma, men bygget på lang og erfaringsbasert tradisjon fra tibetansk buddhisme. Nevner også hvordan mage-pust minker bevegelsen i diafragma. Suboptimal breathing patterns and impairments of posture and trunk stability are often associated with musculoskeletal complaints such as low back pain. A therapeutic exercise that promotes optimal posture (diaphragm and lumbar spine position), and neuromuscular control of the deep abdominals, diaphragm, and pelvic floor (lumbar-pelvic stabilization) is desirable for utilization with patients who demonstrate suboptimal respiration and posture. This clinical suggestion presents a therapeutic exercise called the 90/90 bridge with ball and balloon. This exercise was designed to optimize breathing and enhance both posture and stability in order to improve function and/or decrease pain. Research and theory related to the technique are also discussed. Richardson et al.27 describe coordination of the Transversus abdominis and the diaphragm in respiration during tasks in which stability is maintained by tonic activity of these muscles. During inspiration, the diaphragm contracts concentrically, whereas the transversus abdominis contracts eccentrically. The muscles function in reverse during exhalation with the diaphragm contracting eccentrically while the transversus abdominis contracts concentrically. Hodges et al. 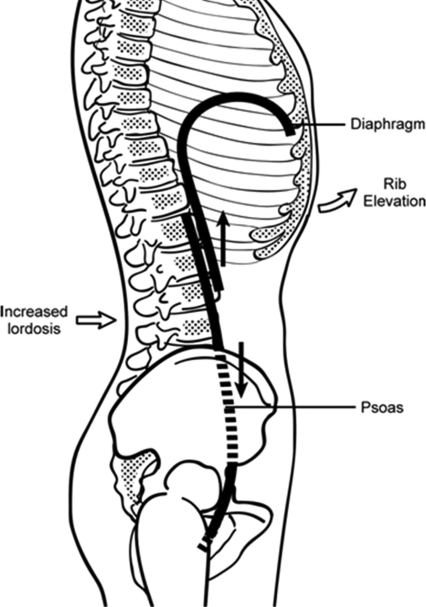 noted that during respiratory disease the coordinating function between the transversus abdominis and diaphragm was reduced.6 Thus, it is also possible that faulty posture such as over lengthened abdominals and excessive lordosis could reduce the coordination of the diaphragm and transversus abdominis during respiration and stabilization activities. The right hemidiaphragm attaches distally to the anterior portions of the first through third lumbar vertebrae (L1-3) and the left hemidiaphragm attaches distally on the first and second lumbar vertebrae (L1-2).29 This section of the diaphragm is referred to as the crura. Of interest is the asymmetrical attachment of the diaphragm with the left hemidiaphragm attaching to L1-2 and the right portion attaching to L1-3. The patient/athlete is asked to hold the balloon with one hand and inhale through his/her nose with the tongue on the roof of the mouth (normal rest position) and then exhale through his/her mouth into the balloon. The inhalation, to about 75% of maximum, is typically 3-4 seconds in duration, and the complete exhalation is usually 5-8 seconds long followed by a 2-3 second pause. This slowed breathing is thought to further relax the neuromuscular system/parasympathetic nervous system and generally decrease resting muscle tone. Ideally the patient/athlete will be able to inhale again without pinching off the balloon with their teeth, lips, or fingertips. This requires maintenance of intra-abdominal pressure to allow inhalation through the nose without the air coming back out of the balloon and into the mouth. When the exercise is performed by the patient/athlete with hamstring and gluteus maximus (glut max) activation (hip extensors) the pelvis moves into a relative posterior pelvic tilt and the ribs into relative depression and internal rotation. 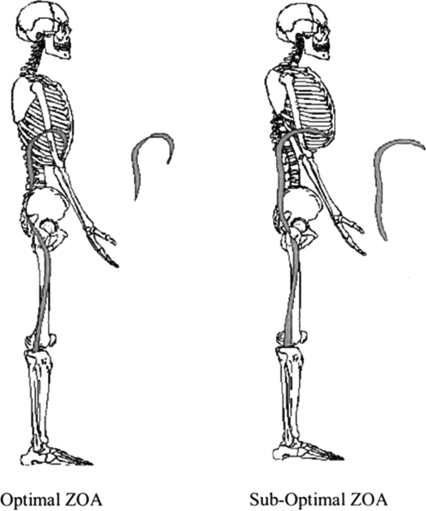 This pelvic and rib position helps to optimize abdominal length (decreases) and diaphragm length/ZOA (increases). Clinical experience with the BBE includes utilization of the exercise for both female and male patients (more females than males), ages 5-89 with a wide variety of diagnoses including: low back pain, trochanteric bursitis, SIJ pain, asthma, COPD, acetabular labral tear, anterior knee pain, thoracic outlet syndrome (TOS) and sciatica. Dette innlegget ble publisert i Forskning og artikler, Highlight artikler og merket med Behandling, bevegelse, bindevev, Diafragma, Hyperventilering, Pustemønster, Pustemuskler, ryggraden, Smerte, trening. Bokmerk permalenken.